One of my biggest dreams is to go to Japan, whether for studying or a simple trip. I like Japan’s culture—I get to know about it from the Pop Culture such as J-pop, anime, manga, etc which is quite popular here in Indonesia. Because I like it, I decided to study Japanese Literature at university. I wanted to learn more about Japan. From then, I joined an Indonesian college student theatre group which use Japanese language as their main language in every performance. From the coach, I came to know about Sing Out Asia (SOA). 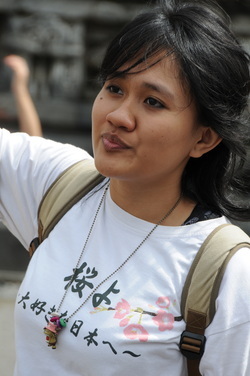 I was very lucky to be choosen as one of Indonesian representatives in SOA: Japan Visit 2012. Ever since I heard about the program after SOA Trip in Indonesia last March, I always prayed to be choosen, because the number for participants in Japan Visit 2012 is limited. That’s why, I was very happy when my coach said I can join Japan Visit this year! There’s some trouble when we’re preparing the document to go to Japan, because out of the three Indonesian students who joined, none of us has ever go abroad before. Despite the trouble, the three of us was at loss of words when our plane arrived at Haneda airport. It was a mixed feeling. I remember the moment I came out of the plane. The chilly wind, the dark sky, the sight of shining Haneda airport building at the distant… I took a deep breath and thought: so, this is really Japan. We spent our first night at Yoyogi Olympic Youth Centre. It was fascinating because we got to see some Japanese students who also spent their night there for Gasshuku. The rule there is pretty strict. For example, we can’t use the recreation room past midnight, we have to take care our own garbage, we’re not allowed to make noise and bring foods to our room, etc. It sure feels a lot like a dorm rather than general lodging. In that place too, I came to know about the greatness of Japan’s toilet. It’s so advanced and a lot easier to use than the current technology my country had. Now, I understand how the Japanese member feels about the toilet when they came to my country. First day of Japan Visit 2012, we went around sight-seeing Tokyo. We visited Asakusa, Akihabara, etc. One of the Japanese members also introduced me to the wonderfulness of Gacha. I got quite addicted to it until our last day in Japan. The rest of the one-week trip was spent by visiting Lake Kawaguchi near Mountain Fuji, home-stay at Tochigi, visiting temples, etc. Among that, the luckiest moment for me was at Lake Kawaguchi. I tried the fortune-telling at the temple around there—the one where we simply take a random folded paper which had our fortune written in it, just by paying 100 yen. I got “Daikichi”, the luckiest of all result. At the same day, when we arrived at Tokyo, I played another gacha. One of my friends asked which prize do I wanted the most from that gacha. I pointed at one picture on the machine without thinking much about it. I didn’t even expected to actually got the one I pointed at! Even my friend amazed by that! Maybe the fortune-telling was right after all. During Japan Visit 2012, experiencing and seeing Japan first-hand, I realized that basically all people from all country are all the same. We heard a lot of rumors about how people from a certain country act, and stereotyped them based on that rumors. But the truth is: every individual has their own uniqueness. When we interact with them, we have to find out their characters and understanding them instead of judge them based on the stereotypes. Sing Out Asia is the first cross-cultural program I joined. I was very nervous, meeting a lot of people from different countries for the first time. I do my research about the characteristics of people from another country, so I was too afraid to do something which will offend them. But I realized that it’s just like meeting new people in the same country. All I have to do is be brave and try to understand each other. Then, a cross cultural friendship will be made! I learn about lot of things during Japan Visit 2012. It will be extremely long if I put it all in one report, but it sure will be the most unforgettable moment in my life. No words are enough to express how grateful I am to be given this chance. Thank you so much, Mr. Hatano! I also want to say thank you to all of people who joined and helped during our visit to Japan. This amazing experience wouldn’t happen if any one of you were not there. And of course, I should thank my theatre coach who introduced me to Sing Out Asia, Kaikiri-sensei. Thank you Sing Out Asia! I hope we can all meet again, someday!